Top Draw Pty. Ltd t/as “FLYHISPORTS” started in 2013. Two businessmen with over 50 years combined textile, manufacturing and importing experience, saw an opportunity to service the teamwear category within Australia. We are a proudly Melbourne based sportswear brand serving all of Australia. 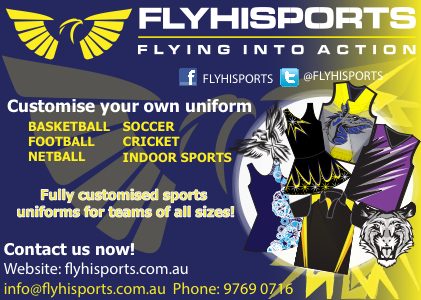 FLYHISPORTS sports and team wear solutions allows your school, club, association, sports team, or business uniform to be customized however you choose. We have a team of designers ready to bring your design to life. We have a collaborative approach to design and highly value your design guidance. The color range is virtually unlimited. Based on the back of exceptional service and quality we have been fortunate to experience rapid growth over the last 5 years and now partner some National and State based associations but still proudly service entry level social teams. Athletics, Baseball, Basketball, Calisthenics, Cars & Bikes, Cheer, Cricket, Dance, Dragon Boats, Football, Gym, Gymnastics, Hockey, Indoor Sports, Martial Arts, Netball, Oz-Tag / Touch, Pony, Rugby, Schools, Soccer, Softball, Table Tennis, Tennis, Volleyball, Workwear. As the manufacturer, we can offer lower costs and faster turnaround times. Our offers include a large variety of fabrics suitable for specific sports and pricing options, we are experts in sublimated sportswear and offer cut and sew options with additional embellishments including embroidery, screen print, transfer print, glitter prints, applique and rhinestone application. We would love the opportunity to enhance your school, club, or sports team’s presentation and appearance and provide a personalized touch on an apparel item to make it an attractive, affordable, and comfortable feel for both your participants and spectators combined.